When I watch our pundits pontificate on affairs in the Middle East, I usually wind up pounding my forehead on the table: Things can't possibly be as simple as all that, and this "short history" of Islam proves that. 1. Islam is a far more complex phenomenon than a bunch of savage fanatics waving their swords and swearing "death to the Great Satan. Obvious with even a minimum of reflection but always a good corrective considering the "crap" the media bombards us with. Just to mention one tradition that has a direct bearing on Western development: Faylasuf (philosophy). Without the efforts of men like Avicenna and Averroes (and other, less well known lights) it's unlikely the West could have recovered as much of its Greek heritage as it has. Not to mention those traditions that have no direct Western parallel such as Shariah and sufism. 2. Until c. 1750, Western Europe was a backwater in human history, and the Crusades were a brushfire war on the periphery of Islam. The richest, most advanced, most innovative civilizations of the world were either Islamic, Chinese or Indian. 3. Islam today wrestles with the same problems that plagued the West in the transition from the agrarian paradigm that had ruled human destiny since 10,000 BC to the modern one. 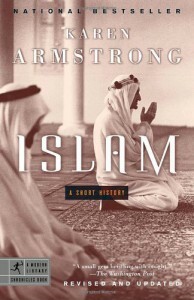 Armstrong goes to great length to show that Islam is no more prone to violent extremism than any other creed, religious our secular. In fact, Islam's emphasis on creating a just society here on Earth was several centuries ahead of the West's concerns about social welfare and human rights. Unfortunately, knowing human history, it's the reactionaries and fundamentalists who write the agendas. The moderate voices on all sides are drowned by the fear-stricken shouts of the bigots (just witness the hysteria over Iran). As with Muhammad, the earlier bio I reviewed this week, this is a good introduction to a complex subject for any non-Muslim wanting to escape the simplistic BS that passes for analysis in the mainstream press.